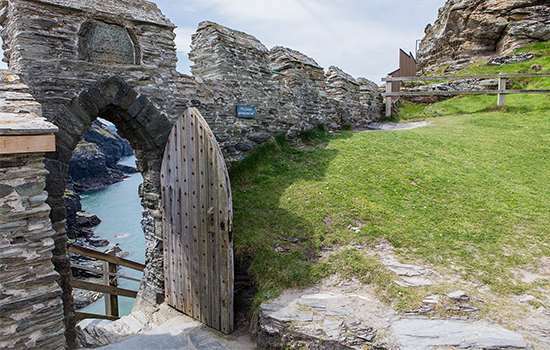 You’ve probably heard of King Arthur, but did you know that his legend inspired Richard, Earl of Cornwall, to build a castle at the seat of the ancient Cornish kings in the 1230s? You can visit the castle ruins, located on Cornwall’s rugged north coast between Padstow and Bude, and see for yourself what has been firing the imaginations of writers and artists for more than eight centuries. Leashed dogs are allowed on the castle grounds, but be aware that there are steep cliff drops and older dogs may find the terrain too strenuous. Castle facilities include dog bins and a water bowl outside the shop. For more information, visit the website. If you want to avoid the crowds and enjoy a tranquil hike through some of Cornwall’s wilder scenery, Bodmin Moor is a great day out. 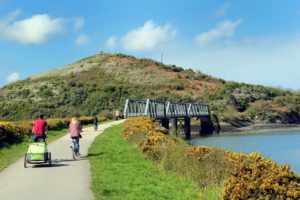 For less experienced hikers, the Camel Trail is an ideal choice – the 18-mile, multi-use trail runs along a disused railway line between Bodmin and Padstow and is virtually flat. More experienced hikers may wish to walk up to Brown Willy – the highest point in Cornwall. The summit is 1,378 feet above sea level and offers spectacular views across the moor, although the hike shouldn’t be attempted during adverse weather conditions. Nearby Jamaica Inn is a great dog-friendly pit stop – you can also take well-behaved dogs into the inn’s fascinating Smugglers’ Museum and learn about the wreckers that inspired Daphne du Maurier’s famous novel. 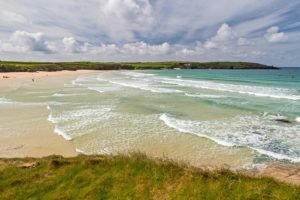 With its sheltered location and fine golden sand, Harlyn Bay, just west of Padstow, is considered one of the best family beaches in Cornwall. 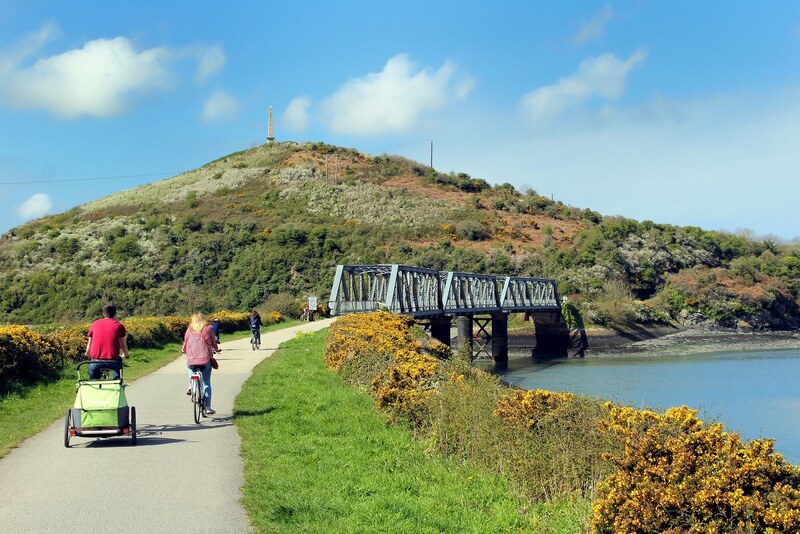 Popular with novice surfers, sea kayakers, and walkers alike, Harlyn is also a big hit among dog owners because unlike many Cornish beaches, it’s dog-friendly all year round. At low tide, it’s the perfect place for a game of fetch with your pup. 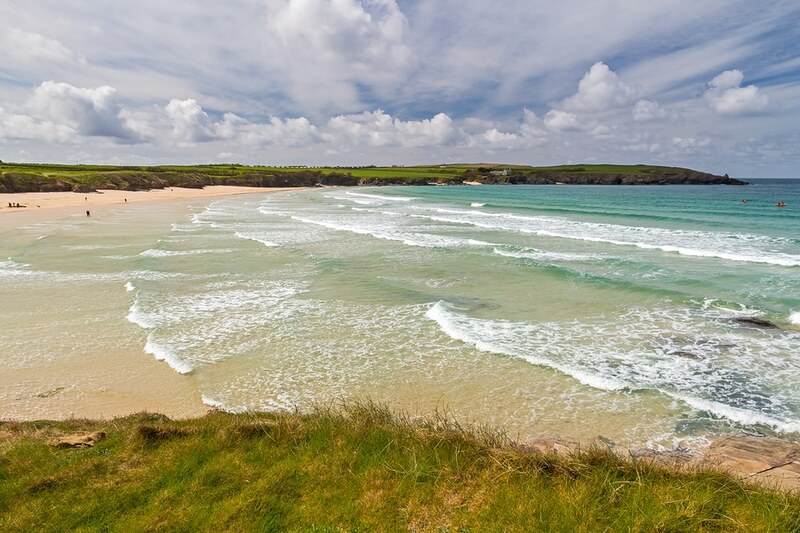 You can find a complete list of dog-friendly Cornish beaches here. History buffs can learn about more than 300 years of military history at Cornwall’s Regimental Museum in Bodmin. 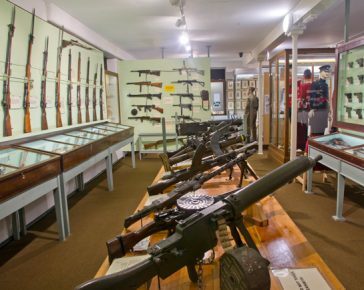 This former headquarters of the Duke of Cornwall’s Light Infantry houses 12,000 collection items, including weapons, uniforms, and artwork, from Napoleonic times to the present day. Dogs are allowed throughout the museum, which is home to three office dogs – Django, Spingo, and Nessie. Did you know that a female lobster can carry around 20,000 eggs under her abdomen? Or that only one of those eggs is expected to survive in the wild? 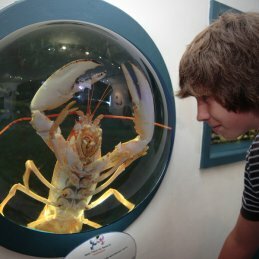 Learn everything you’ve ever wanted to know about crustaceans, marine conservation, and the Cornish fishing industry at the National Lobster Hatchery, located on the quayside at Padstow harbour. You can even adopt your very own lobster! Well-behaved canine companions are welcome throughout the facility. For opening hours and more information, visit the website. Looking for somewhere to stay in North Cornwall with your pup? The Point has a variety of excellent dog-friendly accommodation within a short distance of all these attractions, and many more pet-friendly activities. Book your next vacation today – we look forward to welcoming you and your pet. Dogs are of course also welcome on the golf course.